I have made a conscious decision to not write any pieces concerning the Ducks during the lockout (my small, inconsequential form of protest), but this is just too good to pass up: a chance to take a walk down memory lane and relive one of my most formative hockey experiences – and a chance to watch games from an era of the NHL not too far removed chronologically (only a decade ago) but practically prehistoric in terms of style of play. Remember obstruction? Remember the two-line passing (or, in this case, lack thereof)? Remember the Stay Puft Marshmallow Man who played goal for the Mighty Ducks? Wait, no: his name was Jean-Sebastien Gigeure. Yes, kiddies: it was a crazy time in ye olde NHL, so gather ‘round and enjoy as I ‘Play-by-Play DVR Blog’ Game 6 of the 2003 Western Conference Semi-Final series between the Mighty Ducks of Anaheim and the Dallas Stars. After sweeping the defending Stanley Cup Champions Detroit Red Wings in the first round, The Mighty Ducks won the first two games of their next series against the first seeded team Dallas (including an epic 5 OT Game 1). They lost two of the next three, but nevertheless found themselves in position to eliminate Dallas in Game 6. This is cool: FSNPT has the voices of the Ducks, John Ahlers and Brian Hayward hosting this shindig. Say what you will about him and his biases, but Hayward has been the Ducks’ color man since 1993. It’s fitting that he be involved. I wonder when this was recoded? It doesn’t look current – the feed is clearly SD. Fox wouldn’t have put this together for filler during this lockout, would they? Perhaps for the last lockout. You know the one. From seven years ago? Dear God, that’s all the time that’s passed? Ugh. 20:00 – What a different time it was in the NHL. The home team wore white. 19:40 – Great make-up on this Ducks team. Also, strangely, a group I can hardly remember. Sure, Paul Kariya and Steve Rucchin were mainstays, but the forward lines were rounded out by guys like Adam Oates, Steve “Stumpy” Thomas, Stanislav Chistov (remember how great he was supposed to be? ), Jason Krog, and Mike freakin’ Leclerc. Rob Niedermeyer and Peter Sykora also had starring roles. Also, who the heck is Patric Kjellberg? Isn’t he the guy who was a Swedish police officer before coming over to the NHL? (He was.) Crazy. Patrolling the blue line, you had longtime Duck Ruslan Salei (RIP), along with guys like Keith freakin’ Carney, Niclas Havelid, Sandis Ozolinch, and Kurt Sauer. My memories of this team are strangely vague. 19:08 – There’s a reason the Ducks were the underdogs in every series they were in this playoffs. Keith freakin’ Carney was leading them in average ice time. I mean, the guy was a good, solid defenseman but…Keith Carney? Really? 18:20 – Giguere was just so damn good this playoffs. So on his game – angles are perfect, moving well laterally. Sick. 17:30 – Holy wow, Adam Oates has been clicking in the face-off circle to the tune of 61% in the series. When was the last time any Duck center was anywhere near even 55%? Is he available for a face-off coaching gig? Oh…wait. 16:46 – Names I’ve heard so far of guys still playing in the League: Giguere, Sykora, Robidas, Morrow, Arnott. 16:38 – Mike Babcock looks very young. And Paul Devorski isn’t wearing a helmet. Awesome. 16:12 – So. Much. Obstruction. There would have been a penalty called every five seconds is this game had been played in the “new” NHL. I’ve gotta wonder though: does allowing players to obstruct and interfere, which of course encourages the obstructed and interfered with players to fight through checks, make for better playoff hockey? It certainly speaks to a specific “wanting it” level. 14:50 – And Dallas is on the board first. Kirk Muller from Niko Kapanen. Bad, bad defensive breakdown on Anaheim’s part. Oates left his assignment (Muller). Giguere had no chance. Quick: how many players participating in this series as players are currently NHL head coaches? Off the top of my head, I’ve got Muller (Carolina), Oates (Washington) and Bylsma (Pittsburgh). 13:20 – Guys, remember Stu Barnes? Dude was a great playoff performer. He just had a shorthanded shot on goal. Smart play by Barnesy to just get it on net. 12:18 – Mighty Ducks didn’t do much with that power play. To be fair, they didn’t exactly light the world on fire offensively during these playoffs. They survived on smart defensive play, timely scoring, J.S. Giguere deciding to take the team on his shoulders. 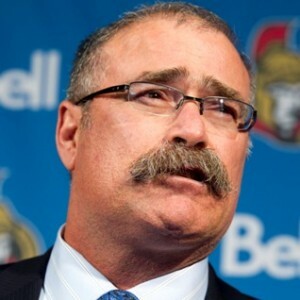 11:35 – SICK goatee and moustache on Billy Guerin and Dave Tippett respectively. Guerin looks like Satan and Tippett looks like a Mid-western news anchor. 10:22 – One of the things the NHL got right coming out of the last lockout was getting rid of the center red line, and thereby eliminating the two-line offside pass rule. Chistov just got whistled for such an infraction. What a tempo killer. 7:31 – Paul Kariya was such a beast. Small, yes – but fast and tenacious. Good, smart player. Puts the puck in the right places. I’d forgotten how much I enjoyed watching him play. 6:42 – I know he wasn’t playing for Anaheim at the time, but it just looks wrong to see anyone but Teemu Selanne wearing #8 for the Ducks. Sandis Ozolinch had it at this point. And remember: when Teemu re-signed in Anaheim coming out of the lockout, he wore #13 for the first season because Ozolinch still had #8. 5:45 – Playoff hockey, no matter which era it takes place in, is still the best. The. Best. This game happened almost ten years ago, and my heart is still pumping just watching the first period. Nothing else like it in all of sports. 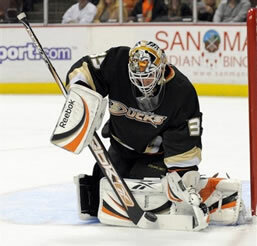 5:15 – Fredrik Olausson doesn’t often get enough credit for his loyalty and service to the Ducks organization. He’s ostensibly the seventh defenseman in this game, and really more of a power play specialist than anything else. John Ahlers just told us that this is Olausson’s third stint with Anaheim (and remember: for a long time, he was the Mighty Ducks’ go to offensive defenseman). Freddy Olausson 4ever. 2:39 – Scary Stars team, too. Mike Modano. Sergei Zubov. Jere Lehtinen. Brenden Morrow. Derien Hatcher. Bill Guerin. Pierre Turgeon. Marty Turco. Claude freakin’ Lemieux. Ah, the halcyon days of the pre-salary cap NHL. 0:47 – And Sami Pahlsson just had a shorthanded breakaway! And people said that the pre-lockout NHL was boring! 0:00 Philippe Boucher just punched Adam Oates in the face at the horn, and Oates just skated away like the veteran he was. Gonna be a good second period! All the talk is about how the Ducks are awful on the power play, and how they might not even want power plays when they get them, so ineffectual are they. My, how some things never change. And Brian Hayward just made the requisite “Can we decline the penalty” joke. Never change, Hazy. Also: Steve Rucchin was nails in the playoffs, and really just in general for the Mighty Ducks. Playing on a hurt knee, doing all the little things. He was really the leader of that team, “C” or no. 19:32 – A crazy lack of post-whistle scrums. Was this the norm back then – and oh my Sykora just got lit right up by Jason Arnott. Looks like a shoulder injury. Wow. 17:35 – Steve Thomas just put the Ducks on the board with a power play goal. Puck came to him near left side of the slot and Thomas showed great patience waiting for Turco to stack the pads and then Stumpy just threw it up top. Huge. 16:47 – Oh man, Vitaly Vishnevski, how I used to adore you and your often ineffectual attempts at open ice hits. But when you landed one…man. Where have you gone? 16:12 – Stephane Robidas just took a pretty obvious dive, and Devorski’s telling him to stop it. Robidas’ nose is still bizarre looking. 15:37 – And my boy Stan Chistov finishes on a broken play! Weird zone entry with Krog flipping the puck into the slot-al direction, with Thomas kicking the puck to Chistov, who finds himself all alone, in on top of Turco who, again, goes down only to have Chistov flip the biscuit up over him. Man. What ever happened to that kid? 14:38 – Wait, what? Paul MacLean (the Paul MacLean – he of the gnarly walrus-stache) was a Mighty Ducks assistant coach under Babcock? What?! I thought I knew a lot about the Ducks and their history, but I had no idea about MacLean. Mind = blown. 12:18 – Was there ever a hockey player more fun to watch skate than Mike Modano? I think not. The way he flew down the wing, jersey flapping in his self-created wind, and letting loose a wicked snap shot mid-stride…a true thing of beauty. 11:00 – Seriously. So. Much. Obstruction. Hooking, holding, you name it. It’s EVERYWHERE. 9:58 – Brutal high stick by Vishnevski on Stu Barnes. Or maybe Barney sold it. Gonna have to see the replay, which I will…momentarily…yep. Like a dagger straight to the face. Of course Barnes was putting a pretty solid hook on Vishnevski at the time. 9:30 – Ah, yes – there’s the post whistle scrums I’ve come to know and love. Lots of pushing and shoving. We’ve got a playoff hockey game on our hands! 7:00 – Chistov hits Zubov behind the net. A little Russion on Russian action…wait, what? Russians throwing body checks in the playoffs? Huh? 5:57 – Kariya out there with Oates and Sykora. Seriously…such a video game line. So random. 5:40 – And Rob DiMaio (remember him?!) redirects a puck past Giguere…now Hayward is saying it went in off of Kapanen. Does it matter? 5:29 – Rucchin almost answers back with a rebound. No such luck. 4:08 – Thomas almost sniped one past Turco’s glove. It was awesome to watch. God, I miss hockey. 3:15 – Hayward just said Sykora’s only 25. Seriously? Wow. He’s the kind of player who, to me, always seemed like an older, veteran player. Now he really is. Then? Maybe not so much. 20:00 – Hazy calls the atmosphere in the building, “electric.” Well, I should hope so! 17:12 – Hitting is really starting to pick up. It’s like Dallas is playing for their lives, or something. 15:15 – The broadcast just flashed a graphic that in 1-goal games during this playoff season, The Mighty Ducks are 7-1 and Dallas is 2-5. If that doesn’t pretty much sum up the run they went on that year, I don’t know what does. 13:32 – Commercial outro: “It looks like anything goes. And Ruslan Salei’s shot has gone in.” Come on, John Ahlers. You’re better than that. 13:09 – I have a mini heart attack every time a goaltender plays the puck “outside” the trapezoid, which of course is patently ridiculous, as it is 2003, and the trapezoid doesn’t yet exist…at least as it pertains to hockey and the NHL. 10:31 – I don’t care what people say. Hockey in the years leading up to the 04-05 lockout was just fine. Players had to fight through more to get to where they wanted to go – it separated the men from the boys. There’s nothing wrong with a defensive struggle. 9:45 – And then Mike Leclerc gets “literally” undressed (thanks, Johnny) on a breakaway – stick hooked away, glove lost. And there’s no call. Maybe some things needed to be addressed. 8:56 – I really don’t know why Chistov didn’t stick in the League. Kid had grit, good hands, skill. He’d go to the net and take abuse. It’s a shame, really. 7:14 – Oh no! Stu Barnes just tied it up. Did he, though? Mike Babcock seems to think that the net was off its mooring, or tilted forward when the puck crossed the line. Hazy’s saying the goal may come back. Ahlers agrees. Oh my God. What’s happening?! The instant replay does not lie. Seems clear cut – the net was off. And the war room in Toronto never mistakes, so this should be an easy call. NO GOAL! YES! Stu Barnes disagrees, and vehemently. But the score stays at 3-2 for the good guys. 7:08 – And Salei takes a slew footing penalty. Yikes! Hazy “doesn’t like [the] call.” Color me surprised. 6:03 – Ducks are absolutely killing it on this PK! Get it? But seriously, they’re doing a really good job denying Dallas time and space to set up in the zone. Viva la Trap! 5:12 – Uh oh. Morrow scores. Zubov wristed it from the point and the puck went in off of Morrow’s foot…but they’re…wait for it…going up stairs to review it!! Phil Hewlett comes on the PA, “The play is under review.” Is it a distinct kicking motion? Again, Hayward and Ahlers seem to think so. I can’t wait to find out! And they call it a goal. Hayward can’t believe it. Neither can Ahlers. No, like, they really, really can’t believe it. Gonna be a hell of a finish! 1:06 – OZOLINCH POKES IN A REBOUND OFF A MIKE LECLERC SHOT!!!! It’s our Carl’s Jr. Play of the Game. Wow. Just, wow. I love this team. I love ‘em, I do! 0:52 – Some serious water skiing going on out there. Today, that’d be penalty, penalty, and more penalty. 0:11 – Ducks catch a major break on a puck not going far enough for icing. Gatorade player of the game was Steve Thomas. Ducks have now knocked off the 1st seeded team (Detroit was the 2nd seeded team). Hand shake alley is all business. Little time spent on that. Signing off til next time.